Figure 1. The different temporal and spatial scales involved in modelling indoor air chemistry to be applied in this consortium. Eventually, such models can be used to predict when indoor air chemistry processes might cause problems (e.g., to human health and wellbeing). MOCCIE models represent the chemistry of indoor environments over a wide range of different spatial and temporal scales from sub-nanometer to tens of meters and from sub-nanosecond to days as shown in Fig. 1. Can we understand indoor chemistry well enough to predict its composition quantitatively with computer models of the fundamental chemical and physical processes? What are the major uncertainties that currently exist in these models? What experiments/field measurements do we need to improve our models? What experiments/field measurements do we need to evaluate our models? Figure 2. Atomically detailed model of the interface of air (black) with skin oil: triglyceride (41%), blue; wax ester (26%), red; free fatty acid (16%), green; squalene (12%), orange; cholesterol ester (5%), cyan. 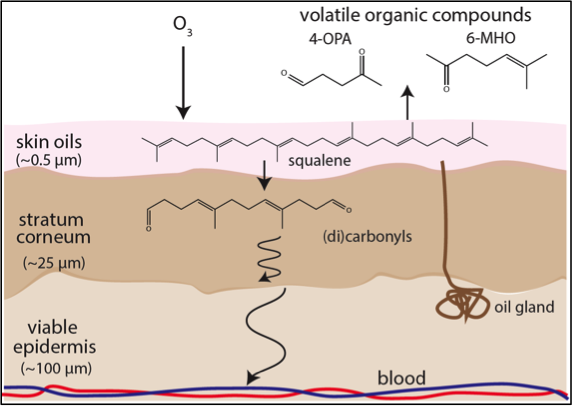 Molecular dynamics simulations gain new mechanistic insights into the transport of ozone and oxidation products through the outermost regions of skin, specifically, the layer of skin oil on the surface and the lipid matrix of the stratum corneum (Fig. 2). Key thermodynamic and kinetic parameters (e.g., partition coefficients, diffusion coefficients, accommodation coefficients, and desorption lifetimes for ozone and oxidation products) are directly implemented in the Shiraiwa group’s kinetic multi-layer skin model (Fig. 3). Figure 3. Schematic of the different elements of the skin surface considered in the model of the Shiraiwa group. The skin model is being extended by accounting for the effects of uptake of indoor pollutants by clothing worn next to the skin. 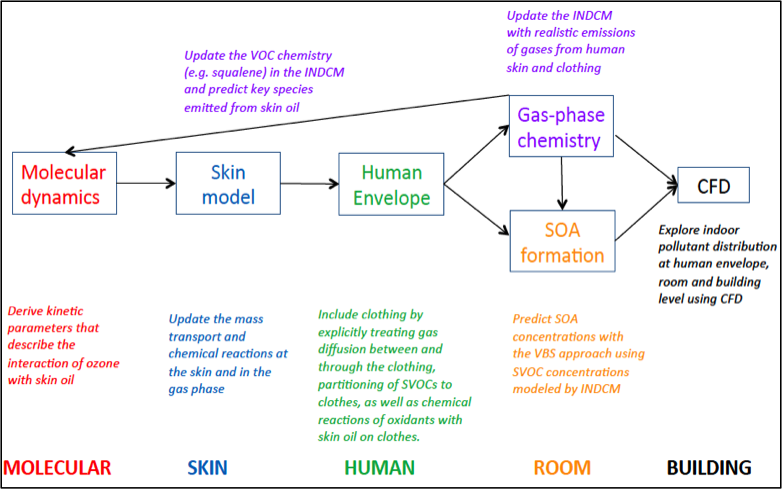 These results will be used to improve representation of emissions from skin and/or clothing in the detailed gas-phase and particle-phase models being developed as part of MOCCIE. Finally, Computational Fluid Dynamics (CFD) modelling is also being applied to evaluate how SVOC emissions by skin/clothing will be distributed in indoor environments. The schematic in Fig. 4 shows how this process incorporates all elements of our modelling consortium. Figure 4. 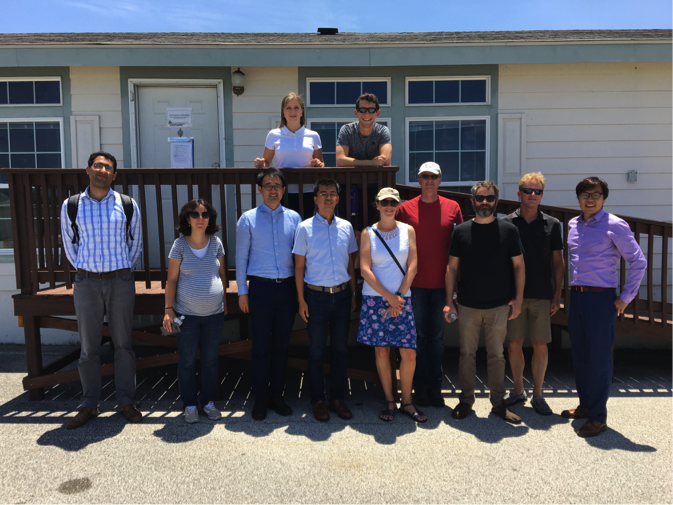 Integration and interconnections of different models in this consortium towards development of a comprehensive indoor chemistry model. Cleaning product or air freshener use can emit large quantities of monoterpenes, as well as monoterpene alcohols. New degradation schemes are being constructed for 5-6 species that are not currently represented in the chemical mechanisms used by the MOCCIE group. We select those which are most ubiquitous indoors and/or have the largest impact on chemistry. We also strengthen links between the gas-phase and particle-phase components of the different models. Cleaning related emissions lead to high concentrations of unsaturated VOCs indoors that can be oxidized to generate large SOA concentrations (~10 to 100 μg/m3). However, it is well established that species with different functional groups will partition with different efficiencies to the aerosol phase: knowing the gas-phase composition is therefore essential to correctly model SOA formation and composition. The volatility of a suite of SVOC compounds as simulated by the detailed chemical model are being computed, and used in the volatility-basis set (VBS) modeling approach to predict SOA concentrations. The VBS model is also being used to explore ozone reactions with surface-sorbed squalene. Observations suggest that low volatility products build up on the surface following ozonolysis, and when a sufficient mass exists on the surface, then nucleation and SOA formation can occur. This process is explored by interfacing with the modelling techniques described in WP1. A sensitivity study will be carried out to identify the processes/species in the model that cause the largest uncertainties. Many if not all of the experimentally-focused grants of the CIE program will yield results that will help us to address the model uncertainties. However, the results of the sensitivity analysis will help us to guide the next generation of experiments for priority in the CIE program to further improve the models. Chemical transport dynamics is being simulated using CFD modeling. We have established a fundamental CFD modeling framework to examine the effects of flow- and surface- related parameters on the heterogeneous distribution of particles and reactive chemicals in the three simulation domains: 1) occupied indoor spaces, 2) near-human microenvironments, and 3) indoor surface boundary layers (Fig. 5). 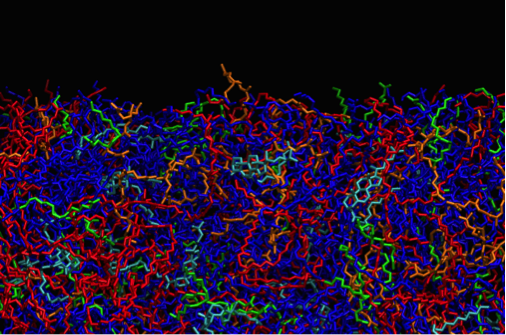 For the three simulation domains, we perform parametric analysis of chemical reactions, sorption and desorption, and aerosol transport to provide insights into model uncertainties. Preliminary CFD benchmark models of indoor chemistry processes are being developed that involve time- and space- dependent pollutant transformation. Figure 5. CFD model simulation examples: (a) a benchmark occupant model; (b) ozone concentrations around a human body; (c) OH- concentrations in a room with sunlight; and (d) OH- concentrations due to a compact fluorescent lamp (CFL). We also use CFD modeling to investigate the deposition of SVOC and SOA formed by skin-oxidant interactions and cleaning related emissions (see WP1&2) to indoor surfaces including textiles and other surfaces. The CFD model simulates turbulent airflow and transport of SVOCs and particles in indoor surface boundary layers. A key task will be to identify parameters (building, building conditions, textile, chemical) that are influential and that should be included in models. We estimate the formation rates of indoor organic films due to particle and SVOC deposition. 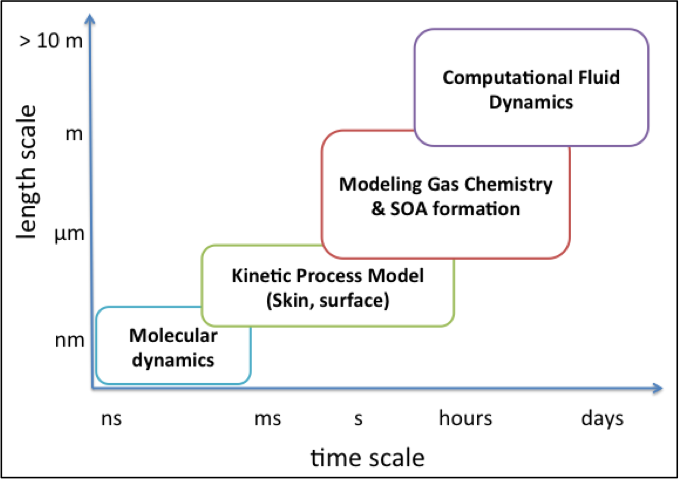 These estimates will provide the first step towards the development of a comprehensive physical-chemical model of the chemistry occurring in indoor surface films, coupled to gas-phase species, which is a key milestone for the CIE program. The specific choice of surfaces will evolve as relevant experimental data from the CIE consortium becomes available, e.g., data on the composition and chemistry of indoor surfaces from the Grassian lab.